I think I may be beginning to dream in French...or maybe I just dream in French cheese, especially when I eat a lot of it! Living in the Haute Savoie this is unavoidable but also delicious so I am not complaining although my jeans sometimes do! Every recipe I see with cheese in, I look for ways of adapting it to use Reblochon and other local and seasonal ingredients - it must be the time of year, as winter approaches and the snow is falling in the Alps and when all the ski resorts burst into life! Winter here in the Haute Savoie is a great excuse for much cheese and carb eating, meaning the classic Tartiflette appears regularly on lunch and dinner tables and menus - need to keep the energy levels up for all the skiing and mountain activities. 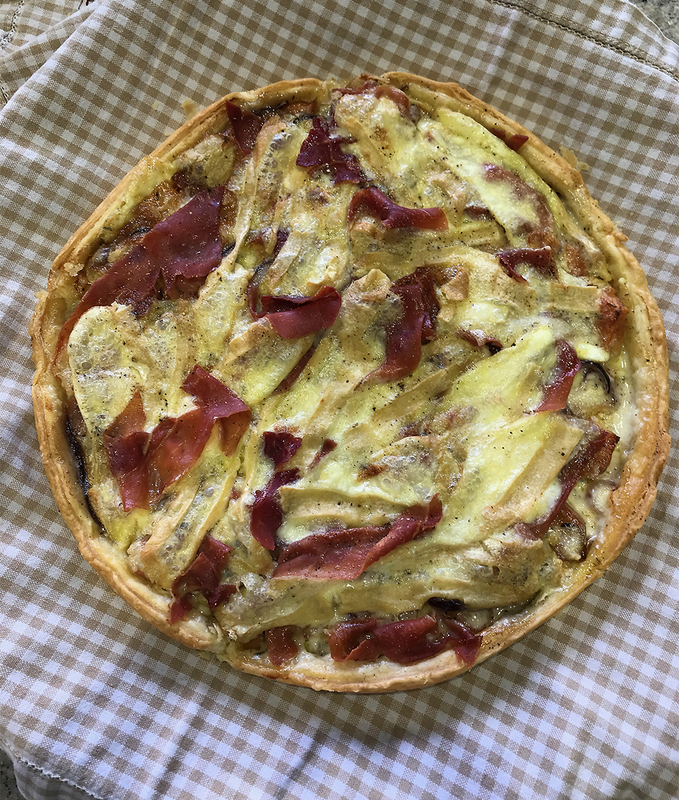 I used sweet potato rather than potatoes for this tart to keep it lighter, you could try it with butternut squash or any pumpkin and in keeping authentic to the region I used the locally cured ham; the Jambon de Savoie. I used the red label Reblochon as this is not as strong as the green label Fermier Reblochon - which is better on your cheeseboard. 1/2 or whole Reblochon cheese - depending on your taste! Slice the sweet potato thinly, or cut into cubes - season with salt and pepper and thyme and coat in olive oil and roast in the oven for 20 minutes until soft but not breaking up. Add the roasted sweet potato pieces to the pastry case. Thinly slice the red onion and place in the pastry case between the sweet potato. Cut the Reblochon into cubes and place in the pastry case between the sweet potato. Add the Jambon de Savoie torn into pieces in between all the ingredients in the pastry case. Season well, add a good glug of olive oil and sprinkle with fresh thyme leaves. Et voila - Bon Appetit! That’s great. It is easy and tasty! Hope you enjoy it. Bon Appétit! Reblechon is fabulous in tarts, and I love the idea to use sweet potato or squash here instead of regular potatoes. We love the combination too!